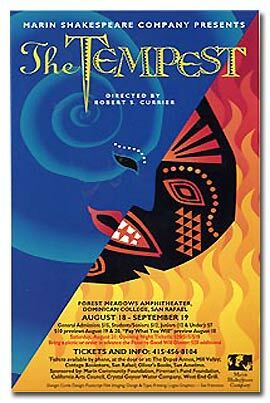 For Robert Currier’s second production, he chose Shakespeare’s final play, the magical romance The Tempest. 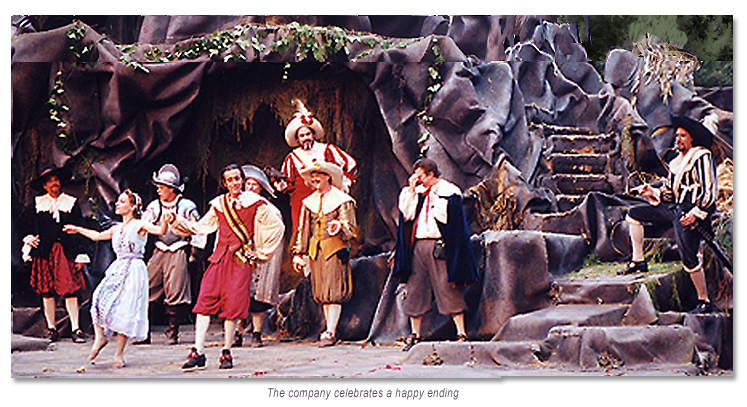 The play was set when it was written, in the early 1600’s, with the visitors to Prospero’s isle dressed in Jacobean costumes. 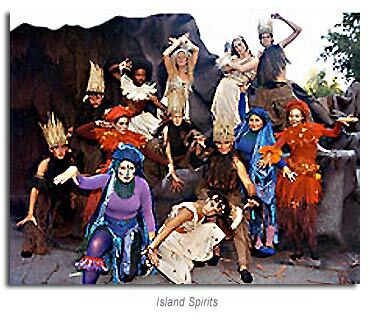 The island itself was imagined to be off the coast of West Africa and its inhabitants were all African, with magic created by African drumming and dance. To assist with the production, we found the marvelous Danny Gorlin, an Ewe drum master from West Marin, and Gael Thompson, a delightful African dance teacher. Jim McKie once again designed a spectacular set. A tall mast was rigged to plunge to the stage during the opening shipwreck scene. It only failed once during a performance (when the actors – who must have been horrified to have a huge beam of wood fall in the wrong direction – coped beautifully.) 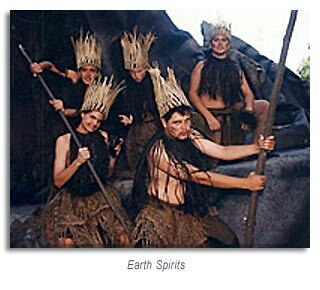 The set itself was a jagged coastline with a tall mountain stage right, which held Prospero’s cave. Ariel made her first appearance onto the stage flying on a wire rigged from a huge Eucalyptus tree behind the tech booth onto the mountaintop. Caliban’s first entrance was equally spectacular, as he emerged from under the lip of the stage, splashing through the moat, and occasionally wetting audience members sitting in the front-row. 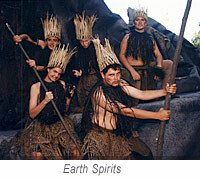 Kim Curtis’ beautifully textured costumes included raffia and feathers as she created elemental island spirits representing earth, air, fire and water. We were thrilled to engage one of our favorite Bay Area actors, the intriguingly quirky and physically gifted Howard Swain, as Prospero. Howard, whose wife Nancy Carlin had played Rosalind for us in our first season, became a father shortly after the production closed and the second Carlin-Swain daughter was named Miranda. 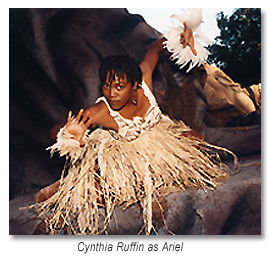 Cynthia Ruffin was an African goddess of an Ariel. 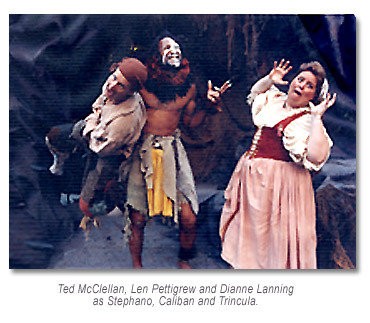 Len Pettigrew, a former professional football player with the Philadelphia Eagles, took on his first theatrical acting job playing Caliban. His natural combination of sheer power with an underlying sweetness combined with a certain naiveté about Shakespeare and theatre worked perfectly, and he was directed less as a monster than as a potentially noble savage. “Each summer as we reinhabit Forest Meadows our elder son Jackson takes to the woods like a savage young Caliban. He knows ‘all the qualities o’ th’ isle’ and can ‘pluck thee berries, show thee a jay’s nest and get thee wood enough.’ This year he decided to dig for treasure on a ridge just off upstage left. The ground is hard and he had just scratched the surface when he uncovered an almost perfect obsidian arrowhead, the first we’ve discovered in four seasons of rooting around building sets and creating magic effects. An omen? Certainly a vivid reminder that Columbus didn’t discover this continent 500 years ago, but merely introduced it to Europeans. 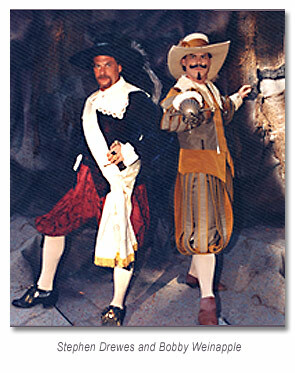 Shakespeare was a cultural descendent of those early explorers and a contemporary of Sir Francis Drake himself. He certainly had the Jamestown expedition – which ran aground in the ‘still vexed Burmudas’ in 1609 – on his mind when he set down this tale. And we are the heirs of that same colonial legacy which has molded America from the Revolutionary War through the Civil War until today.